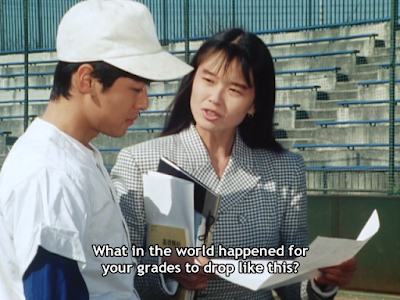 Well I guess I won't be really responding to Shogo B'Stard's Turboranger posts -- where he's talking about episode by episode in contrast to what he did with Chojin Sentai Jetman and previously, Kamen Rider Black. I decided some Goggle V marathon right now -- yes, I'm doing it but it doesn't mean that gone will be the weekly Lupinranger vs. Patranger episode reviews (and DO NOT expect me to give magazine scans since I'd rather see Lupin-X/Pat-X in action first). 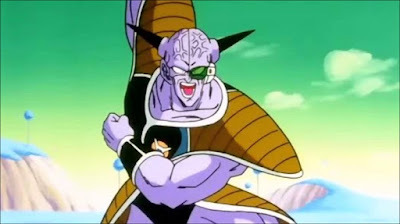 Okay, I guess you know why Ginyu's picture is on top, right? I guess you get le joke behind it. 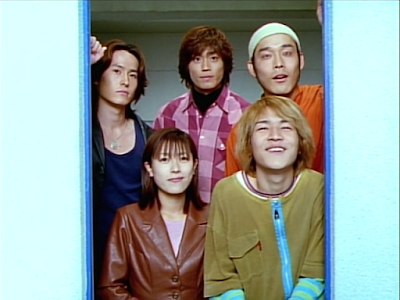 It's because in this episode -- it reminds me of Dekaranger's 19th episode where Hoji switched bodies with Jinche. In this episode, le monster of le week -- Manta Bayarsh swaps bodies with Touma which ends up un a series of hilarious hijinks! 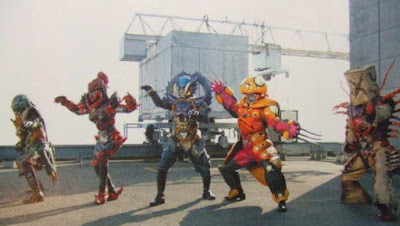 Le episode opens with le Patrangers discussing about le boxes that make le Gangler monsters of le week grow. It turns that they are actually made some some unknown metal -- whether or not le metal will be named is NOT known. But I hope we get an explanation for it. Le Lupinrangers are doing some errands for Le Bistrot Jurer. However, a monster attack happens and they decide to fight. They're after le next Lupin Collection piece only to get stuck in a really tight situation. Here's an interesting Thursday Throwback. 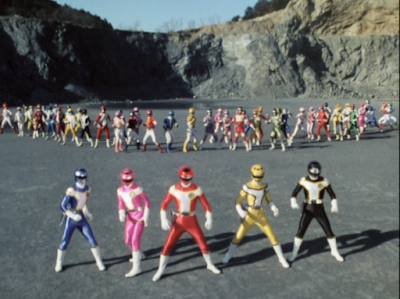 Gekiranger was known to have given tribute to the martial arts legends in the form of the Fist Saints. What slipped off me is why would a series that took place so much last 2007 give tribute to a 1978 film too? One film was called the Five Deadly Venoms by Shaw Brothers which is currently taken over by the Clear Water Bay Company. I haven't seen the film yet but it does look pretty interesting. The film involves five main antagonists who also have the same motifs as the Gekiranger's Five Venom fists. They wore Mexican-wrestler type masks and their motifs are Gecko, Snake, Scorpion, Centipede and Toad. It involves the plot where the dying master of the Poison Clan sends its protagonist Yang Tieh against the rogue members of the clan -- who are causing havoc with their special powers. Well it's time for me to return to "responding" to Shogo B'Stard's Turboranger posts but I'm not going to really be in a debate this time. I'm just using him as part of my inspiration to write about one character who isn't just there to be there. I really thought about how she's not in every single episode yet she plays a very important part. She was first introduced as a Math teacher who was concerned for her students -- all the while she's somewhat stuck with her "archenemy" Professor Dazai in some scenarios who she believes is corrupting the five youth. I find the whole scene where she decides to help Riki out -- seeing that he's lost his powerful touch in baseball is devastating to her. She decides to directly intervene AND really does so. She does what every good teacher does -- suspend whatever activities may be coming in between the students and getting good grades! Bonjour once again my readers! It's time for another Lupinranger vs. Patranger episode review after last week's cliffhanger. It's a pretty intense episode with a lot of policeman focus. Yes, from last week to this week -- we're having le Patrangers on the spotlight. Commissioner Hilltop goes to Le Bistrot Jurer to get some french pastries for his patients. It's le first time he actually shows up at le restaurant. He brings in some treats for his not-so-injured subordinates. This makes Sakuya happy getting some items. Is it me or is he too lovestruck with Umika? At this point, I'm even speculating to what Commissioner Hilltop's reaction will be if they found out that le restaurant workers are indeed le Lupinrangers? I thought I'd actually end any possible friendly debates and exchanges with Shogo B'Stard. Then it happened -- after he wrote about Time Force. Now he's written about Turboranger and maybe, just maybe I'll be exchanging views and enter into yet another friendly debate with him -- all the while I'll focus on Lupinranger vs. Patranger episode reviews. I don't exactly know what to think after hearing from Ukiyaseed that Jetman is getting a DVD release alongside Gaoranger. This has me thinking that my personal favorite series is getting a DVD release? I don't know what to think. I could understand if Gaoranger will get a DVD release because Timeranger will get a DVD release but Jetman this September 25, 2018? I didn't see that coming but I'm glad it did. So much for my crazy suggestion of alternate DVD releases that Shout! 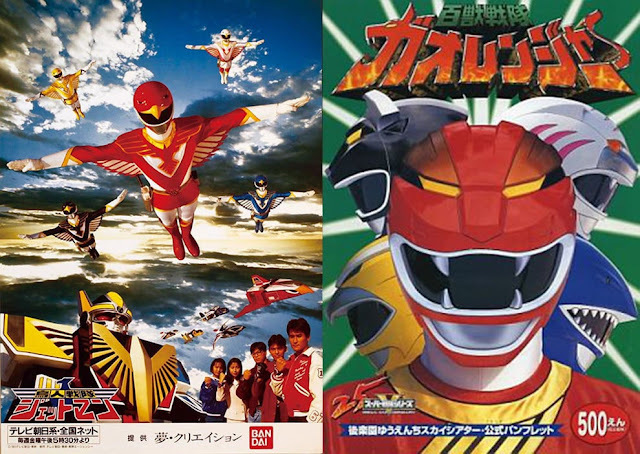 Factory should be releasing Jetman instead of Timeranger (which is set for a July 31, 2018 release). Then why release just one classic when you can have BOTH of them? Shogo B'Stard finally presented his rather long Time Force-related post on the End of Time. I decide to reply to this "debate" (not really) with my thoughts on Timeranger's finale. I like to state it how Toshiki Inoue, Yasuko Kobayashi and I like to lump Judd Lynn with them tend to write weaker finales. I like Jetman but couldn't stand the way Inoue decided to give Gai Yuki a death unworthy of the gates of Valhalla -- then Kobayashi does the same to Naoto Takizawa. I did give out some details on the finale arc in the previous Timeranger entry which will discuss the finale arc. But I may want to make it "more readable but with detail" -- or not. Bonjour everyone! Well I hope I can keep this habit of keeping le whole "French man act" minimal as to avoid making le weekly reviews not so readable. So I'll be using "le" in le place of "the" while keeping it more readable by using mostly English articles to avoid too much confusion like my previous posts. Anyway, let's get down to this rather Patranger focused episode. 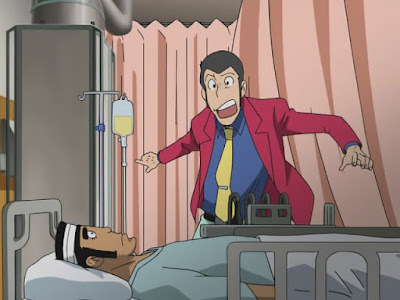 Detective Zenigata errr Keiichiro has no luck with a child. Le child actually prefers le Lupinrangers over le Patrangers. I wonder how many people right now are arguing over which team is better? Anyway, he has no luck as children tend not to like him back.